I’ve been looking for a good book on the process of web design for a while now. David Siegel’s The Secrets of Successful Web Sites looked good, but it was published four years ago… so I’ve been waiting for a long time. Finally, the book I’ve been searching for is here. Author Kelly Goto is well-known as a speaker at the acclaimed ThunderLizard conferences on web design and has been pestered for years about writing a book. The book came to fruition after she finally met her collaborator, Emily Cotler, after Cotler interviewed her for Publish magazine. You would hope that a book about project management would be well-organized, and in this case, you would not be disappointed. Helpfully dividing their process into five phases, the authors spend one chapter giving an overview of the entire process, then detailed chapters exploring the minutiae of each phase. Throughout, the book is filled with useful charts, checklists, and, most importantly, real world examples and case studies, though the latter might have been expanded into more than a two-page spread at the end of each chapter. In addition to useful case studies, the book is peppered with short “Expert Topics” with advice from other bright lights of the web – Jeffrey Zeldman discusses web standards, and Jakob Nielsen discusses usability testing. These are easily digestible “breaks” from the chapter and introduce the reader to a wide range of other personalities and perspectives in the world of web design. Part of this book’s appeal is its confidence that the process it describes will work for everyone. Readers, especially management types, like “authoritative” references, and this book makes authoritative claims. Despite its strong tone, it does not dictate actual design or content “rules” and so it will not ruffle the feathers of the designers and writers on your team. If your “team” consists of just you, it will probably bring much needed structure to your actual work process. The beauty of the Core Process described is that it works equally well on all web projects, regardless of size, scope, or budget. 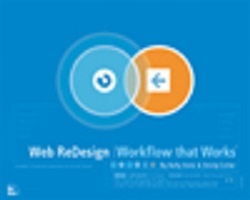 Along with its companion web site, Web ReDesign: Workflow That Works provides web producers, designers, and webmasters with a full set of tools for the creation of both new and redesigned web sites. My enthusiasm is only slightly marred by the title, which may cut out a great portion of the book’s potential audience, leaving them with the impression that it only deals with redesign issues. Goto and Cotler have left very few stones unturned, and I find myself completely satisfied that this book will be for the next few years what David Siegel’s was for the past few: The Book.